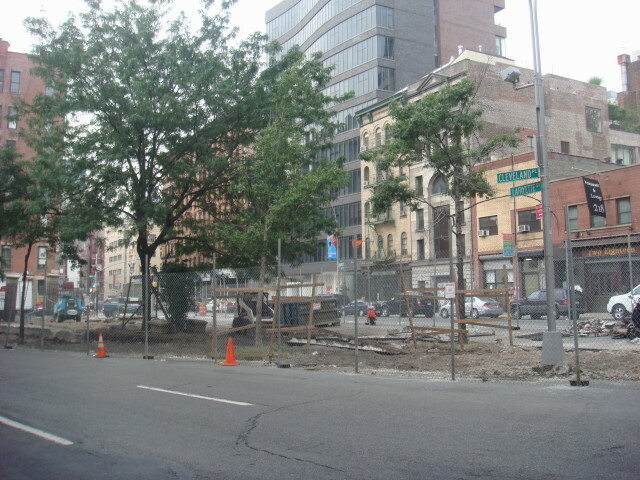 At the point that SoHo and Little Italy meet are some north-south streets (Lafayette St. and Cleveland Place) that join up. Nothing particularly special about that; but whenever streets like that join; there’s a square. And so there is. It’s the Lieutenant Petrosino Square. And the place is undergoing an absolutely total renovation. I encourage you to read the link to the square’s origin. I’ve always thought of it (the few times I did) as something named after a World War I or World War II local hero. Nice, but nothing particularly unknown to nearly any community in the country. But I was wrong. The Lieutenant wasn’t a military man. He was a cop of very uncommon courage and determination. Hey, Teddy Roosevelt liked the guy and that says something about him. (Teddy was the NYC Police Commissioner before becoming governor/vice president and president.) Interestingly, Petrosino almost prevented the assasination of McKinley which led to Teddy becoming president. He immigrated to the US as a boy and became a cop. Not just any cop, but a cop with a decided interest in investigating the Mafia (or Black Hand) both in the US and in Italy. He served both as an undercover investigator and the head of the task force. The Lieutenant went on to help imprison hundreds of criminals and, while performing his duties on assignment in Italy; was killed in the line of duty. 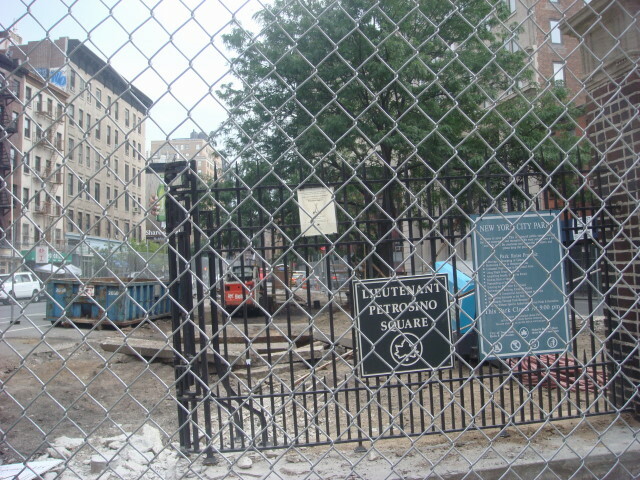 The park is located just north of the old police headquarters and commemorates the life of the only NYC police office killed on duty outside the US. It’s a tiny place and is rather intimate. I don’t know when it will re-open, but I imagine it will be available for sitting, staring, and musing sometime late Fall. This entry was posted on August 5, 2008 at 6:27 pm and is filed under Little Italy, Manhattan, SoHo, Wanderings. You can subscribe via RSS 2.0 feed to this post's comments. You can comment below, or link to this permanent URL from your own site.